You've found the “U.S. Aylesbury Duck Breeders” page here at Hobby Farm Wisdom! If this is the first time you have visited our site: Welcome! Aylesbury ducks are the breed of choice breed in England used since the 1800’s for its superior quality meat. They were one of the first breeds to be introduced to the US from Europe. They are highly esteemed for their pure white color, pink bills, large size, ability to produce eggs in the winter, fast growth, light bones and abundant meat. Males tend to weigh around 10 lbs. and females 9 lbs. They are not great foragers, so they fatten best with concentrated feed. 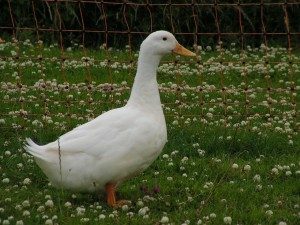 Ducks will lay around 35-125 medium sized white or light green eggs a year. They have white plumage and white skin, orange feet and legs, a horizontal stance and a deep keel which makes them slow and tame. The Aylesbury are used for exhibition and for meat production, although when used for exhibition, these birds will not breed easily.